Joybert's Musings: Coventry as it was before the Cycle Era. TIME - the early part of the present century. 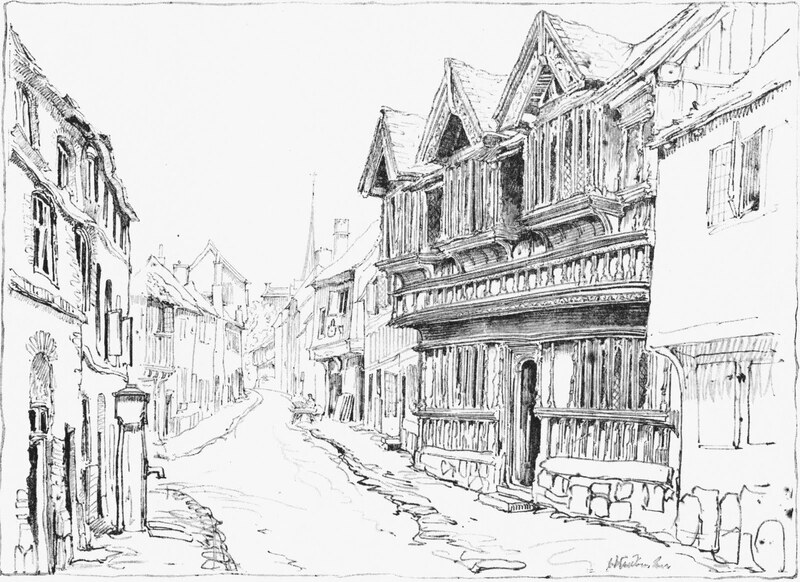 Place - Hertford Street in Coventry town. The sun shines brightly upon a group of loiterers who, at the corner of Hertford Street, watch with eager gaze the cloud of dust that heralds the arrival of the daily mail, not the popular paper of that name, but the stage coach that brings news and passengers from the distant capital. Merrily sounds the horn of the guard as the coachman tools his team down the hill and pulls up with well-calculated precision. The dusty traveller descends from his perch in the rumble; the horses are stabled, the bystanders disperse - the event of the day is over. Then the town resumes the even tenor of its peaceful way, and when the wayfarer re-emerges from the inn refreshed and invigorated, he is struck by the cheerful serenity that reigns around him. He sees the thick brick walls of well-built houses lying snugly ensconced within the leafy luxuriance of their large gardens, and he notes the neat little cottages of the workmen, the many tokens of quiet industry that prevail. The tower of St. Michael, standing clear and distinct against the clear blue of the radiant summer sky, attracts his attention, and he wends his way hither through quaint thoroughfares to admire its beautiful tracery, its carved figures, the fine old trees that rustle and wave above the last resting place of many a stalwart citizen of old, who shrank not in the hour of need from doffing the livery of his trade and donning breast-plate and head-piece in defence of his liberty and of his town. As he stands by the venerable stone building of St. Mary’s Hall, in which the pikes of the city guard occupy a place of honour beneath the Minstrels’ Gallery, the ghosts of the past arise from the adjacent narrow streets with their old English timber built houses, whose overhanging upper stories and gabled roofs slope gently forward darkening the light of day to the dwellers below. He sees, as in a dream, the mad onslaught of the men-at-arms, the desperate defence of the burghers, he hears the din and turmoil of the fratricidal wars of the Roses, when brother warred against brother, father against son. Poor unhappy Mary, Queen of Scots, victim of a cruel destiny and of her own loveliness, issues from her turret chamber and passes by on her way to the Bull Inn, whither she is led for greater security, the hearts of the multitude being inflamed within them at the recital of her woes and a rescue appearing imminent. 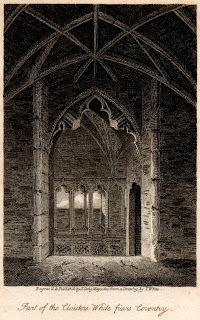 From the dungeons, whose groined roofs charm him by their beauty, and whose dark, noisome recesses fill him with pity for the suffering captives who languished within their narrow limits, he ascends the time-worn steps to the banqueting hall, with its carved ceiling and old stained-glass windows. He notes with appreciative eye the well preserved woven tapestry that lines the base of the large window and the fine portraits of our kings and queens which adorn its walls, whilst a brass tablet informs him that the Duke of Northumberland and the Earl of Leicester, his son, gave and bequeathed a vast tract of land to the people of this town that they might not to all eternity lack pasture for their cattle. 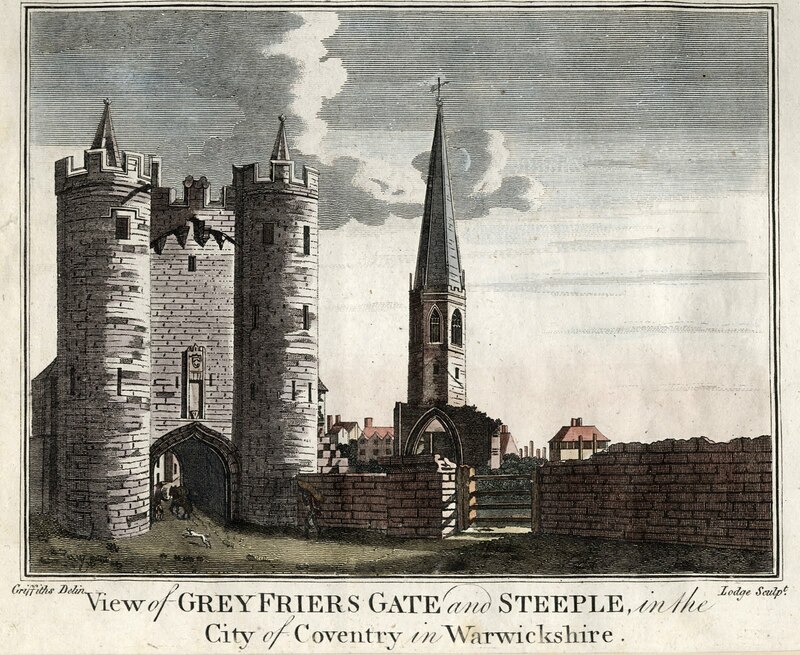 Nearby are the ruins of the priory erected in 1043 by Leofric, Earl of Mercia, and his Countess, the Lady Godiva. 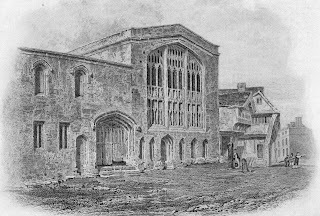 Ford’s Hospital, which was founded in 1529 for the benefit of five old men and one woman, who were granted fivepence a week for maintenance, pleases him greatly with its ornamental work and gables with richly carved large boards and pendants. 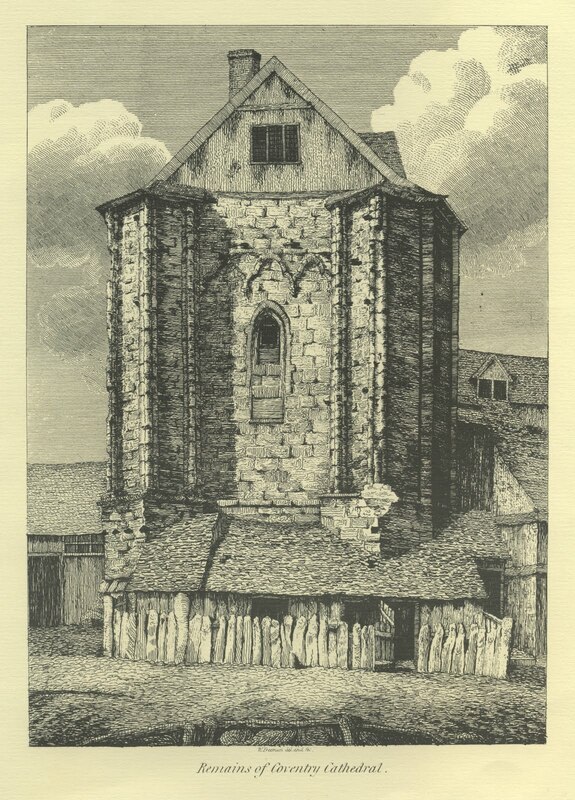 As the sun declines towards the west he finds his way to the ruins of Cheylesmore Manor, and long does he gaze at the stone entrance to the tilting yard, under whose arched gateway had passed many a gallant knight to do battle in his lady’s honour, or to throw the gage of defiance in some hated rival’s face. He then turns his steps to the few remaining portions of the old city wall built by Edward III and originally three yards thick and six yards high, and marks with keen regret that but two of the gates still survive the general wreck. 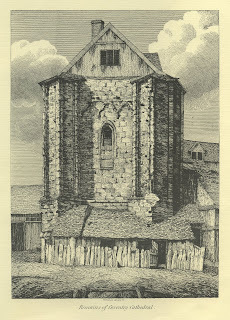 Of much interest to him are the ruined cloisters and chapel of the Greyfriars; the monastery of the Carthusians, their erstwhile rival, he notes, sharing the same mournful fate. As he passes through the more modern part of the town he sees the weavers busy at their looms, and notes the gentle mien of the women spinning at the wheel. He remembers that Coventry was at one time the home of many manufacturers, and was celebrated for its religious pageants originated by the guilds, but he seeks in vain for any traces of the girdlers, the lard-makers, the pinners and needlers; the guilds still extant existing apparently only for social purposes. 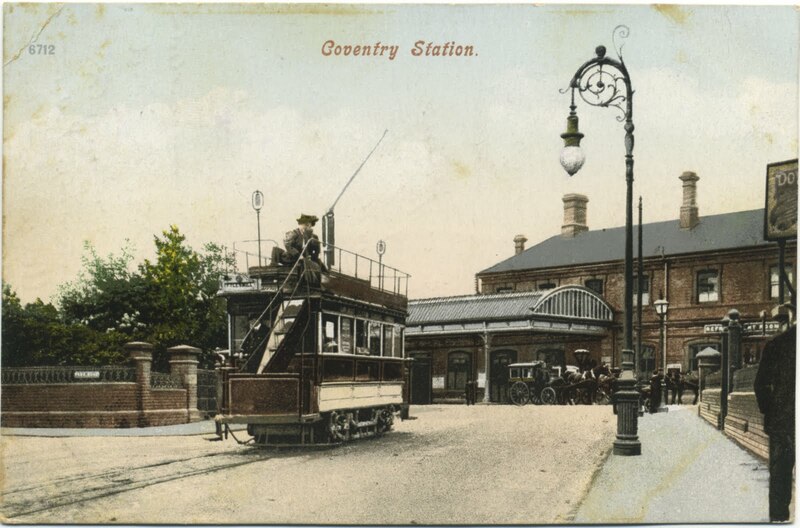 And thus, from our traveller’s recollections we gather that Coventry was very prosperous then in a quiet easy way. 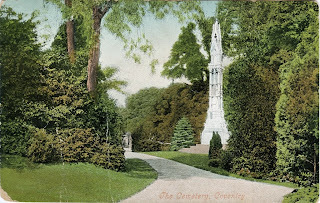 We know that in 1844 the population numbered but 25,000, that the town was for some long time after innocent of any drainage scheme, that its water supply was principally drawn from wells sunk in cellar floors or in underground kitchens, that its burial-grounds were becoming overfull, that no municipal improvements were made, and that few houses were added to those already existing. The manufacture of silks, ribbons and watches was busily carried on for some time, and the town enjoyed a pleasant easy-going prosperity. But presently a change came o’er the spirit of the scene. The duty was taken off French silks and ribbons, there was a sudden influx into England of these foreign commodities, which being more artistic than those manufactured at home captivated the popular taste. 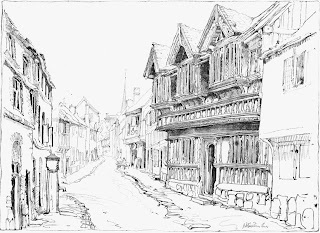 The Coventry weavers could not be brought to see the errors of their ways and disaster fell upon the town. Work was no longer to be had, men stood about the streets in miserable idleness, wives and mothers watched the faces of those dear to them grow thin and haggard, little children wailed aloud for bread and could not be comforted. Distress and starvation waxed even greater and greater, darkening the lives of the dwellers in this once prosperous town. 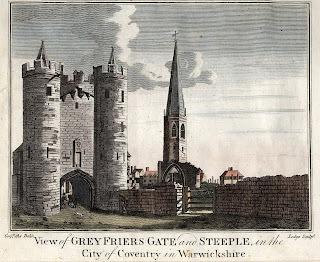 Then indeed did the men of Coventry give the lie to the opinion which good Queen Bess expressed of them. With willing hand and generous hearts the wealthier citizens helped those incapable of helping themselves, they fed the hungry and clothed the naked. Soup kitchens were established and every means taken to help their poorer neighbours. One enlightened man, however, James Marriott by name, foresaw that these remedies were but palliatives, the remedy lay in a totally different procedure. He offered, therefore, to give 500/. to start a new industry - that of sewing machines, which were then just coming into vogue - and so provide work for the willing hands that had so vainly sought it. Accordingly he and other kindred spirits started this business, which was carried on under the name of the Coventry Machinists’ Company. 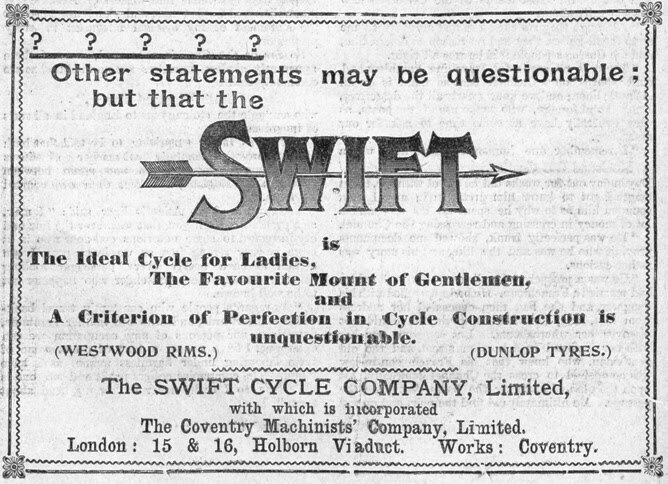 The venture was unfortunately not successful and they then turned their attention to the construction of the earlier type of cycle, the redoubtable Bone-shaker. Their courage met with its due meed of reward, and the business they then started still flourishes and grows apace, and in its train came renewed prosperity and work for the starving people. To these enterprising men is due the origin of the cycling trade, and to them numberless riders raise the pæan of praise. 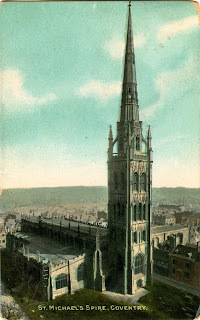 Time has, in its flight, indeed, brought many changes to Coventry which will not fail to be noted by our traveller should he chance to re-visit the City of the Three Spires in this year of grace. He will travel thither by means of the iron horse and may, perhaps, arrive at the dinner hour. Then will he see steam from factories innumerable, whose tall chimneys dwarf their humbler neighbours, endless crowds of men, women, girls, and boys. Chattering and laughing they overflow the narrow pavements, blocking roads already congested with traffic, almost preventing the ordinary pedestrian from continuing on his way, and taking with perfect equanimity the thrust of the wheel with which some cyclist, impatient of delay, seeks to clear a path for himself and his machine. To them a bicycle is a privileged thing, for to it they owe those good wages which enable them to take life right royally and to treat “the missus” to a trip to the seaside when, like her superiors in station, her nerves suffer from the monotony of her existence and she pines for fresh fields and pastures new wherein to display that last new bonnet her “old ‘un” gave her. Gone is all peaceful serenity; elbow-room is of the past. Of houses there is a great lack, and industrious sons of toil have been known to be, perforce, obliged to seek the shelter of the workhouse for want of a better roof. Court lies enfolded within court as densely populated as any London warren, and still the cry arises for more bricks and mortar. Fine old houses rub shoulders with factories, are surrounded by little shops and tenement let to weekly lodgers; encompassed by unworthy neighbours they and their inmates bear this reversal of fortune with what fortitude they may. New buildings arise it is true, but at a rate quite inadequate to cope with the demand, and people of the better class are obliged to seek refuge in hamlets nearby. Great is the demand for workers, and high the wage; well are the hands treated, very prosperous and healthy do they look on the whole. In some of the large factories a room is provided where breakfast or dinner can be cooked, tea or coffee heated; in others seats are provided for the women, female labour being much in demand. Although the lot of the factory-girl is not entirely a happy one, yet single women much prefer this life to that of the domestic servant, and bitterly do the housewives of Coventry complain of the lack of that necessary individual. Observant people are also apt to compare somewhat unfavourably the pert, noisy factory-girl of the period with her quieter sister of the loom, who, they affirm, drew from the more refined character of her work and the harmonious tints of her weaving a certain pleasing gentleness of demeanour and of disposition. 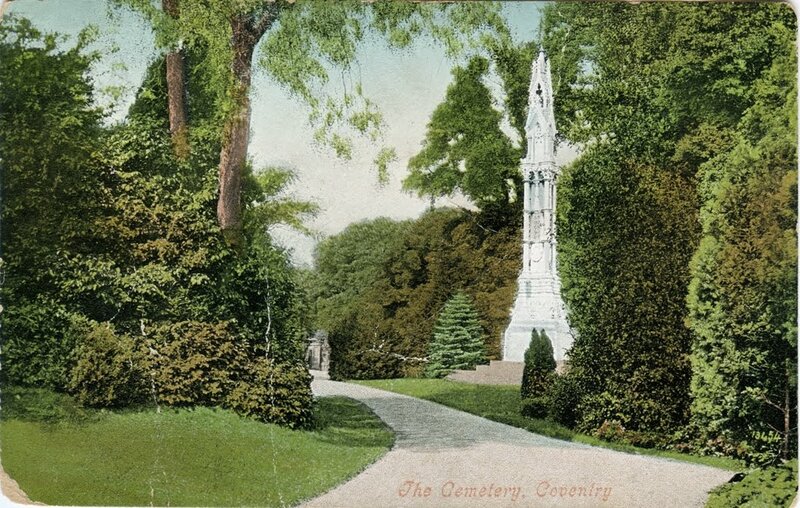 In the streets run electric trams; the water supply of the town is now stored in an underground reservoir whose domed chambers shine in resplendent cleanliness; a new cemetery, picturesquely planted, stands in the London Road; streets are being widened and new municipal buildings erected. The character of the population, which has risen from 25,000 to 70,000, has not been improved by the admixture of Birmingham roughs, and a strong force of police is required to keep order. The watch trade has followed in the wake of the ribbon-making and is a-dying. 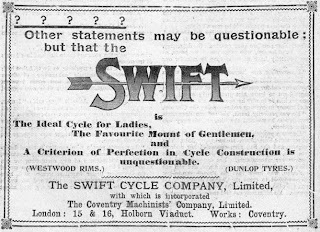 Whether the use of stamping machinery, which cuts out watches by the score, or the superior wage the cyclist-workman draws is to blame is a matter of opinion, but as a matter of fact, the cycling trade reigns supreme in Coventry. It penetrates the whole atmosphere of the place, and large vans filled with the precious merchandise drive at all hours of the day to that station on the hill, whose principal business is apparently the transport of machines to distant climes and to many lands, and whose station would look desolate and forlorn without a friendly cycle leaning affectionately against its brick walls. Everywhere machines swarm, workmen forced from want of proper accommodation to live some miles from the scene of their daily toil ride in of a morning, girls and boys of tender years negotiate the congested traffic with an ease born of much experience and not a little audacity, ladies from outlying districts come in to do their shopping, father and mother meander along in the manner appropriate to a somewhat abundant development of adipose tissue, young men and maidens mount and ride away in the subdued light of a clear May evening, to hear the sweet-voiced nightingale discourse to his love amongst the leafy trees that line the pretty road leading to Kenilworth’s deserted castle. 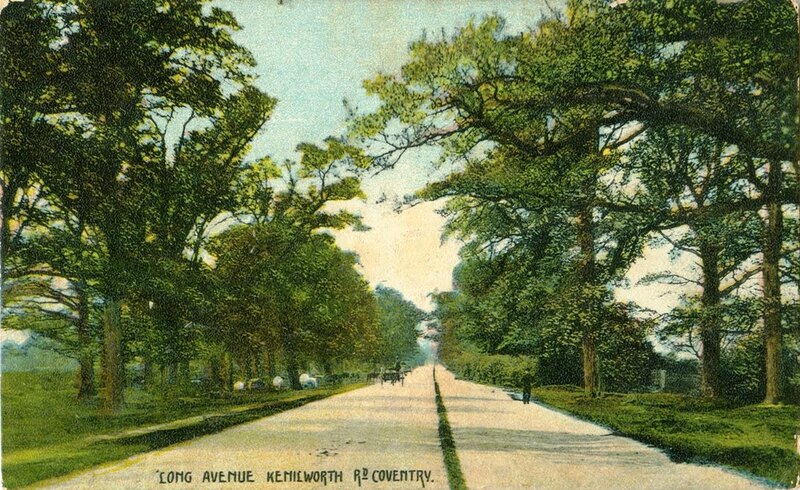 Close to the orchard or gardens, sole relics of the vast tract of land that was to be ever free to the good folks of Coventry and their cattle, still stands the old entrance to Cheylesmore’s tilting ground, but it is now hemmed in by mean cottages and blackened by factory smoke. The stones that once formed part of the city walls, behind whose sheltering arms the burghers left all that was dearest to them on earth when they sallied forth against the invader, stones worn with the scars of time, are now separated by a few yards of narrow road from the hum and the war of a large motor factory. Paupers dine in the cloisters where once paced the meditative grey friars, and the Carthusian monastery looks with mild surprise at the cemetery wherein a crematorium is shortly to be erected. But although much has altered, above all still stretches the same blue vault of Heaven, the birds sing as sweetly as of yore, the pulse of life beats as freely as in our veins, and if the old order changeth it giveth place to a new and perhaps a better one. With thanks to Rob Orland for the use of some of his images.